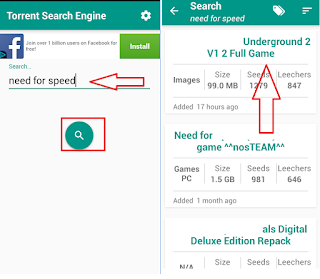 “Torrent Search Engine” is a one of the best app for android to quick search torrent file, this app give full information about file size, seeds, peers, leechers, this app is free and available in google play store, it also has feature like sort by seeders, peers, speed, latest, oldest and size. 2. Open the app, in the search box type your search keyword and tap on search “icon”, you will get all files with detail information, top on the file to start download. 3. If you want to you can search by seeders, peers, speed, latest, oldest and size.